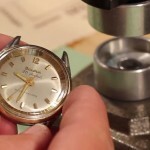 When it comes time to put your watch back together after removing a damaged or broken compression fit watch crystal, you will find that a watch crystal press is an indispensable aide. Learn how to use a crystal press to fit a domed compression fit crystal with this guide. Holding the watch face down, choose the fittings that will hold the watch case properly making sure that the fitting is not pressing on the lugs for the band, the watch case tube, or any area that could be bent easily. A good fitting fixture would sit on the outer part of the watch case or on the watch bezel. 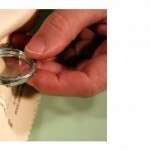 Use a thin protective “Selvyt” cloth on between the fitting and the watch to prevent scratches on the watch case. With a compression fit crystal there are special plastic fixtures that are used to bow the crystal reducing the diameter so it can be inserted or removed. Using a crystal press with the smallest size flat walled fixture you can attempt to bow the crystal without buying the special fixtures. If the crystal is a ladies or smaller diameter crystal, you might need to use no fixture and only the stem that fixtures rest on. 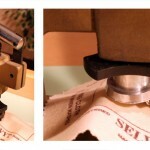 Use a protective cloth over the top fixture and place the watch face down in the press. Use a straight walled fixture to hold the watch crystal in place covered by a “Selvit” cloth and put the watch face down on the press. Center the watch carefully and check that the fixtures are pressing safely on the watch. The amount of pressure that you should use is medium and checking the watch case and sides for any damage before applying more pressure. If the watch crystal does not fit in with medium pressure, you may need to use a crystal that is smaller in diameter.